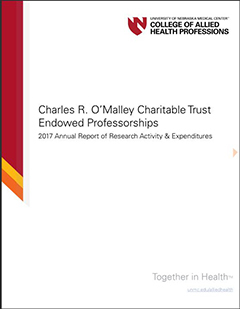 A major goal of the College of Allied Health Professions (CAHP) and a critical factor in our strategic plan is to increase prominence as a research health sciences center that supports evidence-based medicine. To achieve that goal we are creating the infrastructure in the CAHP to facilitate increased research and scholarly activity. Members of our faculty are currently actively working in the following specific research areas: patient safety; rural health; exercise and immune function/inflammation; improving quality of life in developmentally disabled through physical exercise models; educational models for the 21st century; and diagnostic imaging in research. We also support an increase in doctoral and research trained faculty in the allied health professions. Within the past two years, we have expanded our participation in the Medical Sciences Interdepartmental Area (MSIA) graduate program. Physical Therapy Education, Cytotechnology, and Medical Nutrition Education are approved participants within MSIA. CAHP now provides an opportunity for students in programs that offer professional doctorates to compete for summer research assistantships in order to foster interest and to recruit from current or recently graduated CAHP students interested in academic careers. Building a strong, flexible infrastructure to support our involvement in research will continue to be a major focus for the college.